I never intended to make a film—I was a sculptor at the time. Yet I continued shooting hundreds of interviews in every conceivable format. Forty years later, I realized the critical importance of the history embedded in that footage and the intrinsic responsibility to honor the courageous women artists who introduced art that directly addressed the political imperatives of social justice and civil rights. The resulting film is !Women Art Revolution—A Secret History. It features more than fifty interviews, including Judy Baca, Judy Chicago, the Guerrilla Girls, Miranda July, Adrian Piper, Yvonne Rainer, Marcia Tucker, and Hannah Wilke, as well as many others. The Feminist Art Movement was an activist movement that radically transformed the art and culture of our time by providing a model for cultural and political change. Art protests were waged against discrimination and racial exclusion as well as violence against women, radically transforming culture and eventually becoming what many historians now feel is the most significant political art movement of the late twentieth century. !Women Art Revolution—A Secret History took forty-two years to find the inherently optimistic and uncompromising legacy of that movement. Coincidentally, underground comics emerged during that same turbulent era of the late 1960s. At that time, free speech, civil rights, politics, and art fused and then transfused into the culture. Bearing in mind that humor may be our defense against the universe, I invited the legendary cartoonist Spain Rodriguez to create a graphic novel from some of the incongruous and irrational episodes in the fragmented history of that era. With insightful wit, energy, and attention to detail, Alexandra Chowaniec was the third collaborator on the graphic novel. The excerpts here represent only a few of the many outrageously comical episodes that impacted this history. That many of these incidents now appear ludicrous is testament to how far we have come and, poignantly, how far we still need to go. At !Women Art Revolution you order the complete graphic novel and also see free clips from the film. The graphic novel includes a curriculum guide by the art historians Krista G. Lynes and Claire Daigle, and a comprehensive film and video guide by the feminist scholar Fiona Summers. In the hopes of continuing the revolution, RAW/WAR was created as both a website and an installation. An interactive, community-curated video archive, it provides a forum in which users can come together, share their stories, and collaboratively contribute to the history of feminist art and activism. To date, the archive includes more than four hundred artworks. The film !Women Art Revolution—A Secret History is distributed by Zeitgeist Films. The film opens theatrically at the IFC Center in New York on June 1, 2011. For scheduled screenings throughout the US and purchase information, please visit the Zeitgeist site. Introductory text © Lynn Hershman Leeson. 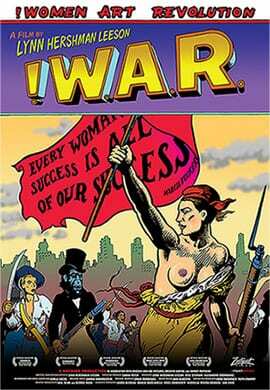 The graphic novel !Women Art Revolution—A Secret History © Hotwire Productions, LLC.